Pylon Network presents the most up-to-date version of its open-source blockchain code, and invites the use of energy market players – consumers, producers, prosumers and marketers / energy cooperatives. The Pylon blockchain creates a neutral database, which simplifies users’ access to their energy data, allowing them to share and benefit from it. 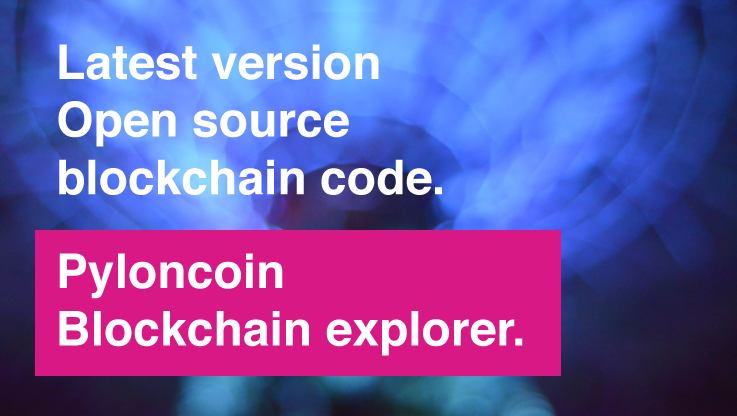 Pylon Network publishes the latest version of the open source blockchain code. This software enables endless possibilities that will help the energy market become more transparent and competitive. It is a tool that simplifies the user access to their energy data. In addition, the nature of the blockchain technology allows the management of privacy and the access to this data. What changes with this innovative data management system? Total neutrality is achieved, enabling free competition in the energy market. Now it is the consumer / producer / prosumer himself who decides what to do with his energy consumption or production data, being able to choose which third party – marketer or ESCO – to give him the data and save up to 2 months of his electricity bill. This personalized transfer also empowers the marketers / cooperatives or energy services companies because they can offer rates or services tailored to each user, gaining competitiveness. Why is the code Open-Source? – Low energy consumption, 500 tx / Wh. – Non-competitive mining – with our certified nodes, we promote PoC cooperation against the PoW competition to improve energy efficiency and minimize hardware costs. – Compatible with the new data protection policies. – Access permission – allows interaction between the actors of the energy market while maintaining privacy. The Pylon blockchain is up and running, and to prove it, the Pyloncoin Blockchain Explorer has been made public. It is a web portal, where the user can verify and trace any operation performed in the blockchain. 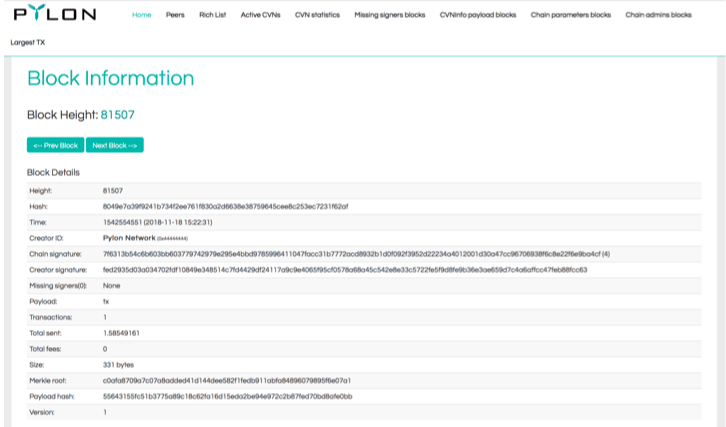 – Consult transactions within a block. – Know details of each transaction, such as the moment it was generated, the address of the origin and the recipient, the information contained in an encrypted form. -The active nodes that approve the transactions and when they have been approved. 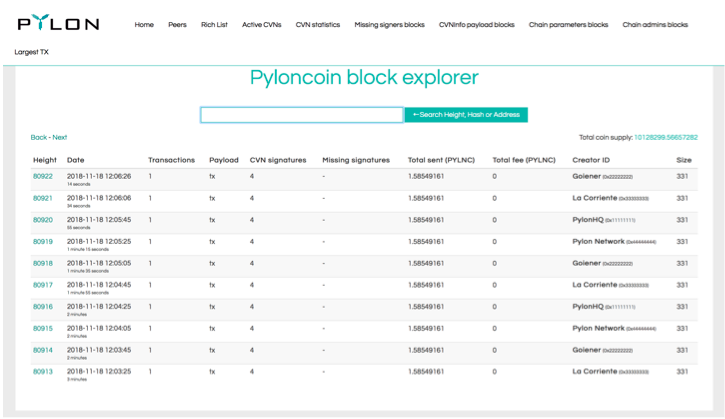 Next we leave some captures of the Pyloncoin Blockchain explorer. Pylon Network is the first blokchain algorithm developed specifically for the needs of the energy sector. We offer the Pylon blockchain as an open source communication protocol, addressed to all actors in the energy market and we invite you to join the energy transition.